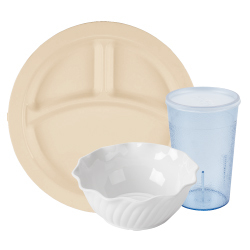 Ensure safe and sanitary service by using this healthcare dishware and beverageware, including plastic dishes and lids for bowls. Use healthcare meal equipment to easily wheel large quantities of items and maintain proper holding temperatures while you transport food to patients. Many healthcare trays feature non-skid surfaces, and meal servers are often insulated and have compatible covers to prevent contamination. Whether you need food warmers to keep meals hot until service, or you're looking for mobile delivery carts you can move from room to room, we have the products you need. Our healthcare meal delivery systems are perfect for cafeterias or in-room dining. We offer different sizes of trays and carts to accommodate the number of people you're serving. 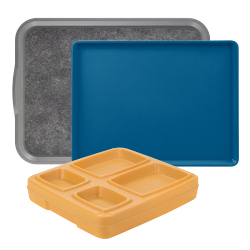 Our trays also come in many colors, so you can color-code service and prevent cross-contamination. For additional healthcare supplies, check out our healthcare china, healthcare glasses, and disposable medicine cups. If you're wondering where to buy healthcare meal delivery systems, we have a large selection of healthcare meal delivery systems for sale at the lowest prices. Healthcare meal delivery systems streamline your serving process, so you can accommodate and serve many patients and residents in your hospital, assisted living center, or nursing home. We offer complete heating systems that keep serving underliners warm until delivery as well as insulated meal delivery carts on wheels. For room service, use a meal delivery system that features an insulated base and cover to keep meals hot inside. Our healthcare dishware, dietary trays, and beverageware options are perfect for your cafeteria. They're made of durable plastics that eliminate the potential for dangerous broken glass shards, and they're easy to clean. These dinnerware options also come with lids if spillage is a concern. 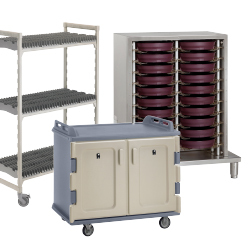 When your staff is cleaning up after service, our storage and drying racks will help dry off large, cumbersome trays and delivery containers.